Every once in a while I like to go to a Berlin record convention. The records there are a little more expensive than in thrift stores but generally of much better quality. It´s nice to be in a room filled with choice stuff for a change, instead of my usual neighborhood stores where I have to wade through heaps of garbage. I hadn´t found so much on that one day a couple of years ago, and was about ready to leave when I came across a seller specializing in magazines. 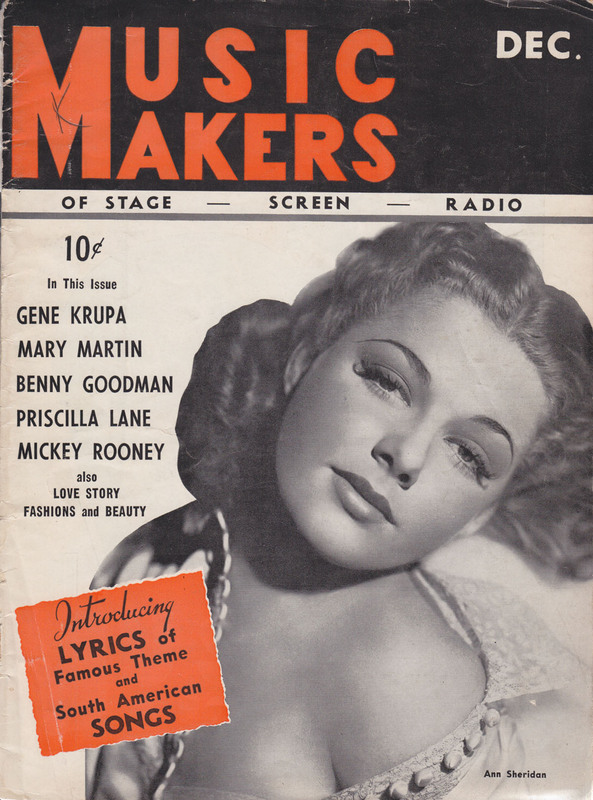 While randomly browsing through some of them, I noticed this Music Makers (of stage-screen-radio!) 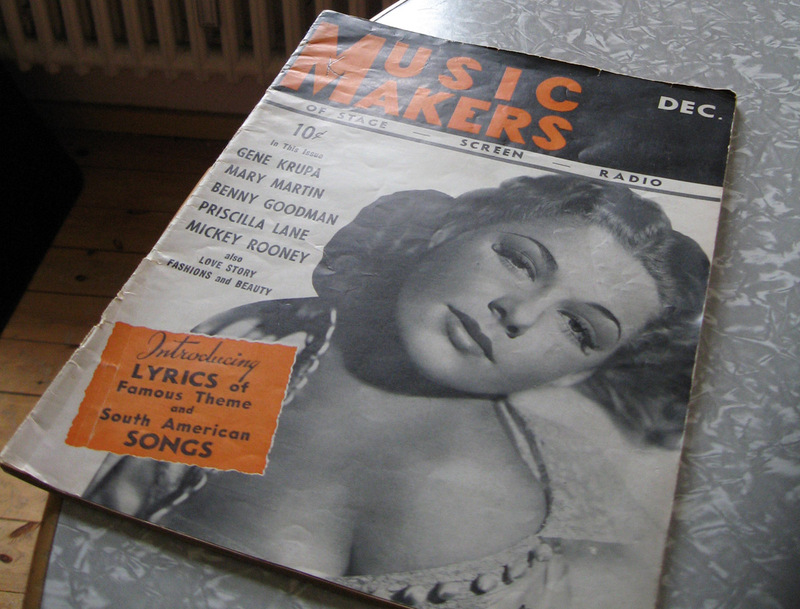 magazine from December 1940, way down at the bottom of the stack. At first it seemed like a typical tabloid featuring the regular pop stars of the swing era – no real jazz music in there with all of the featured artists being white. 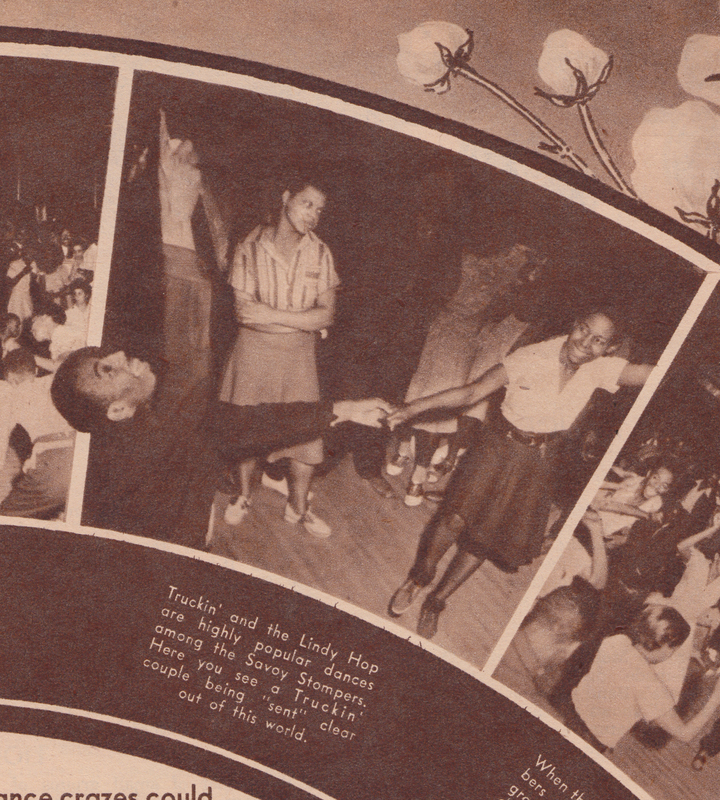 When suddenly, somewhere in the middle of the magazine, I saw this double spread about the SAVOY BALLROOM! Immediately I knew that I wanted this magazine and I took it home for four euros. 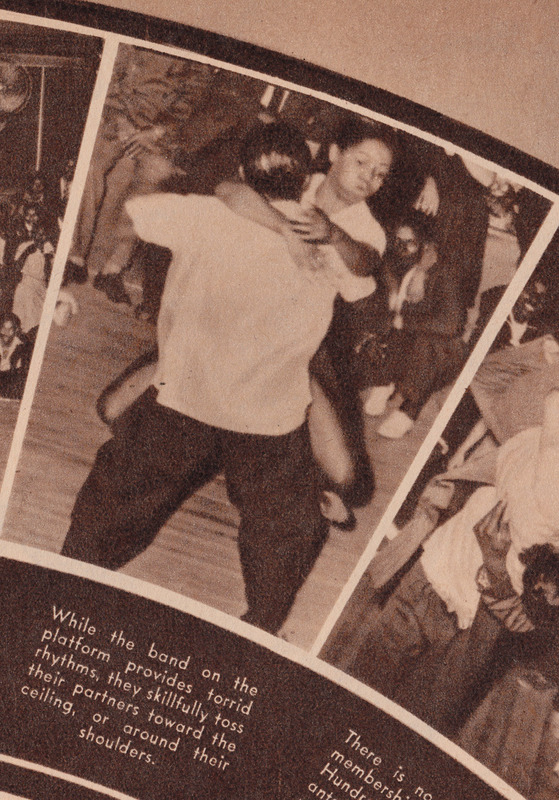 If you search the Internet for photos of the Savoy Ballroom or even just any period lindy hoppers, the same handful of images seem to pop up. I haven´t seen these shots before, so I thought it would be nice to share them. They´re pictures of regulars at the club, some of them sitting on the floor, watching couples doing some wild air steps. The atmosphere is casual, not very ballroomsy, the girls are wearing simple skirts and saddle shoes, lotsa guys are without ties, some of them wearing sandals. It must have been in the midst of the summer. Sadly the accompanying article is full-on racist. 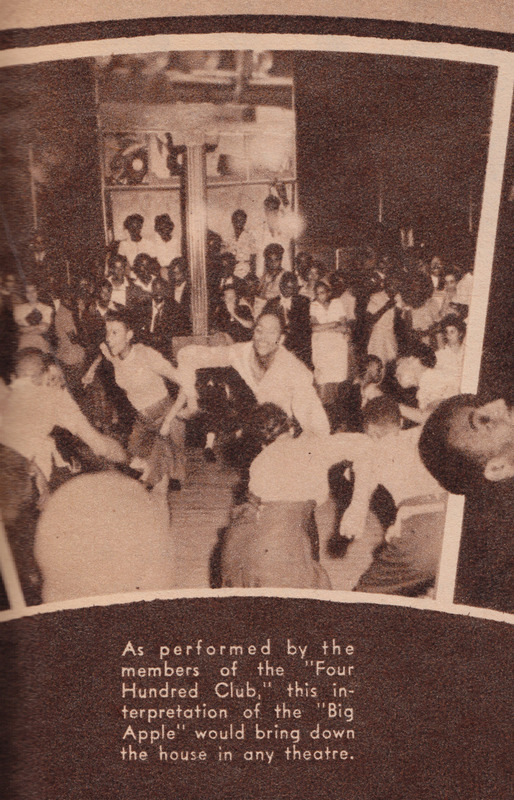 It shouldn´t be surprising regarding the nature of this white pop magazine, but it´s still worth remembering, while we enjoy swing dancing and listening to swing music today, how common racism was in the 30s. The article reflects the widespread bigotry of the period, when it was hip to be entertained by Cab Calloway at the Cotton Club, where black people were not allowed. Few people actually went to Harlem to hang out, let alone move there like Mezz Mezzrow, who was a junkie. The whole country was segregated. But it was still nowhere near the degree of murderous racism that was taking place right here in Berlin at the same time in 1940. Now it´s always said, that the Savoy Ballroom was the only integrated ballroom in the U.S. and probably the whole world. If you look closely, you can even find some white faces in these photos. Double-click on them and they will get much bigger. Just for historical accuracy and to remind us of the dubious source of these images, I transcribed the article in full. So please don´t blame me for reproducing the racist trash talk or the numerous irregularities in this exploitation piece. It´s what came with these pictures. 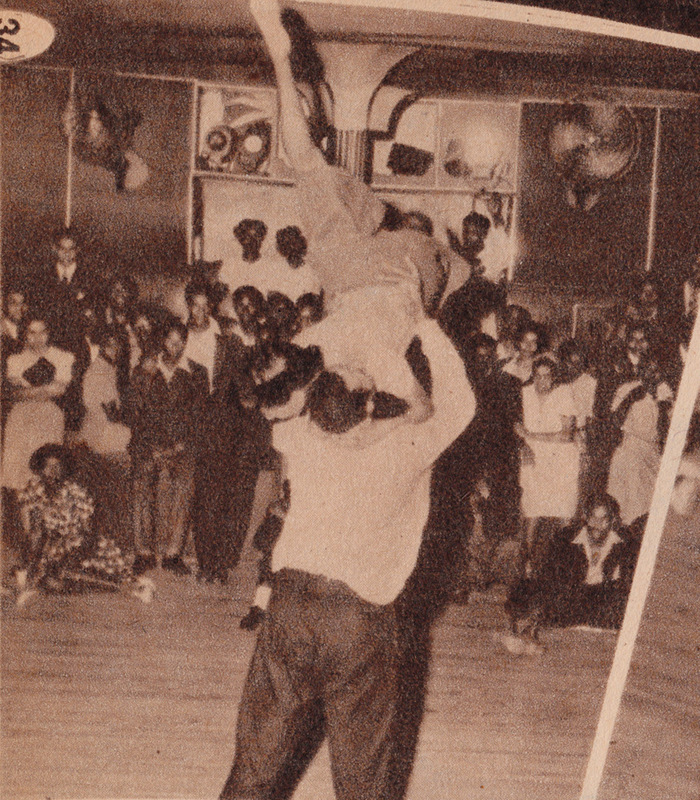 THINK it over – and if you want to know the reason why darkies were born come along to Harlem´s Savoy ballroom. Sure, someone has to to plant the cotton, and someone has to pick the corn, just like the song says. Someone has to shine shoes and wait on tables and do housework, but that ain´t all. Someone´s gotta dance. Someone´s gotta play hot, rapturous jazz on a piano and a trumpet, on a high laughing clarinet, on low mournful trombones. Some colored gal in a flashy evening gown has to stand at a microphone and sing the blues away, while a mean horn plays all in and out and around the melody. Down below the platform, on the long dimly-lighted dance floor, the boys and girls are struttin´, jivin´, cuttin´ up. The days´s work is done. No boss to´yell orders. Only rhythm. Plenty of rhythm. All God´s chillun got rhythm. For fifteen years this has been going on at the Savoy, in the heart of Harlem, the greatest colored community in the world. Remember, way back in the twenties, when the Charleston was the rage all over the country? The Charleston was born at the Savoy. 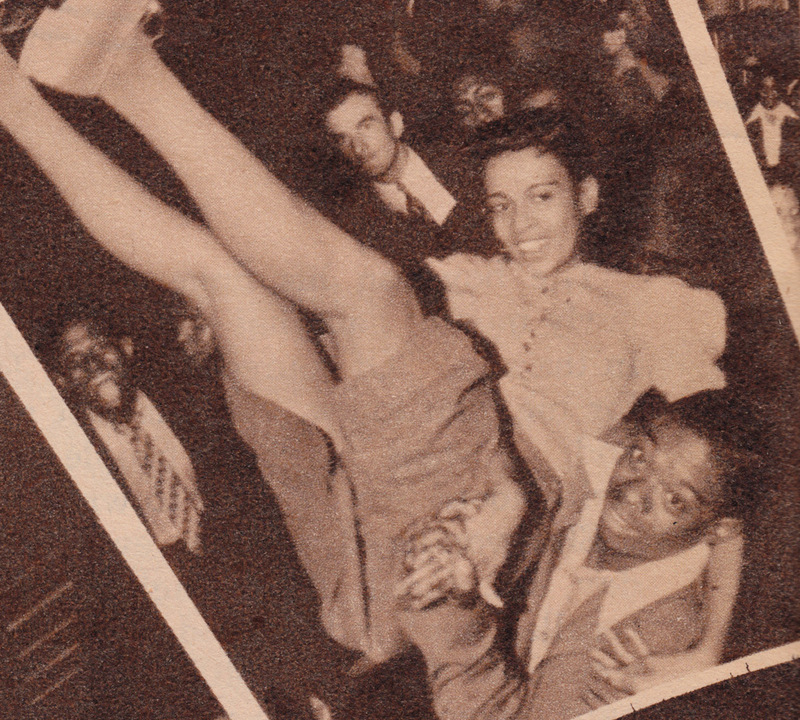 A sepia cavalcade of jazz could be based on the dance crazes that were cradled in one upper Manhattan ballroom. 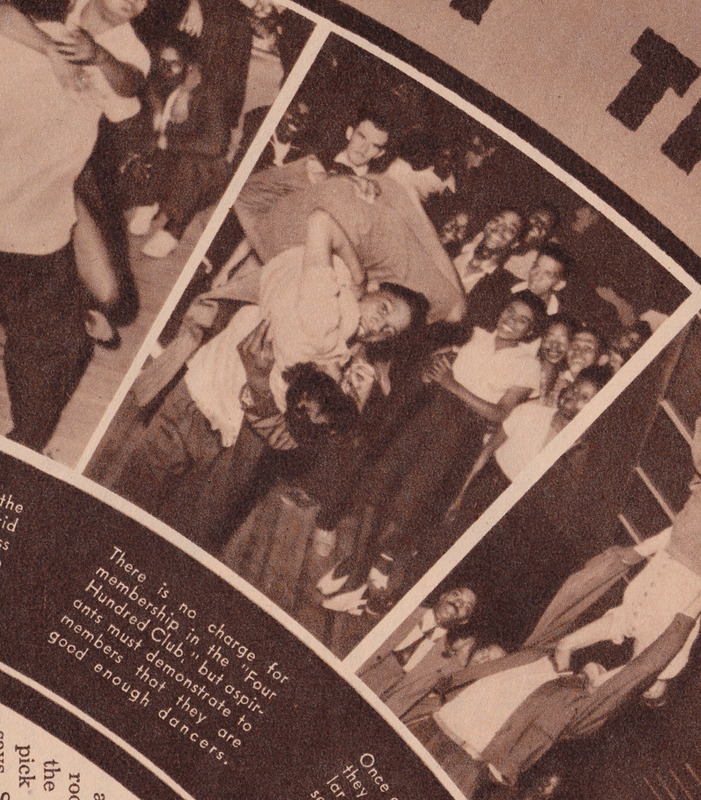 After the Charleston, they gave out the Blackbottom and it was succeeded by the Lindy Hop, Truckin´, Suzy-Q, Boogie-Woogie and Big Apple, with a few others in between. For dancing like that, ecstatic, jubilant, all out dancing you have to have music. That´s where Duke Ellington, the great Duke who means so much to American music, comes in. He got his first big breaks at the Savoy. The late drummer genius Chick Webb was discovered here. Ella Fitzgerald, Cab Calloway, Louis Armstrong, Jimmy Lunceford, Erskine and Coleman Hawkins, The Four Ink Spots – began their careers in the Savoy. 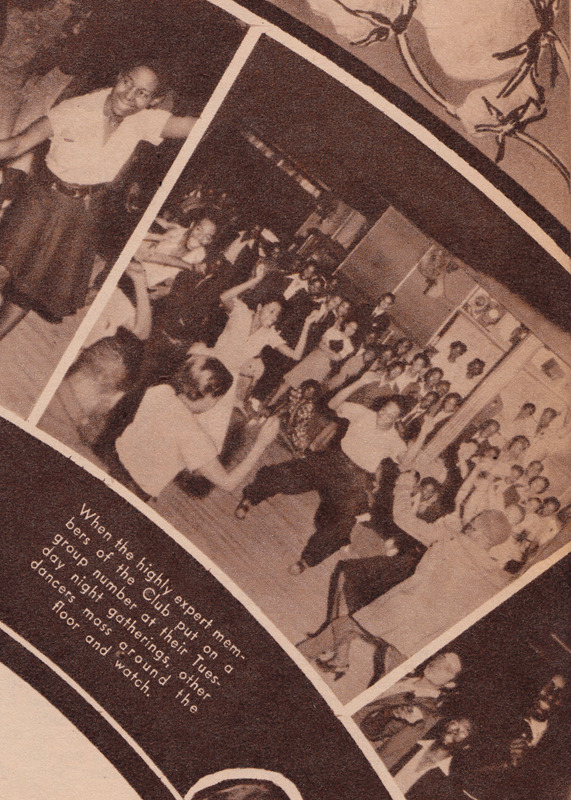 The kids who go there – attracted by a reasonable admission price, ten-cent beer and jazz played by masters – go strictly to dance. Many songs have been composed by musicians, sitting around its lively atmosphere. They say Hoagy Carmichael wrote his ever popular “Stardust” while sitting at the Savoy. 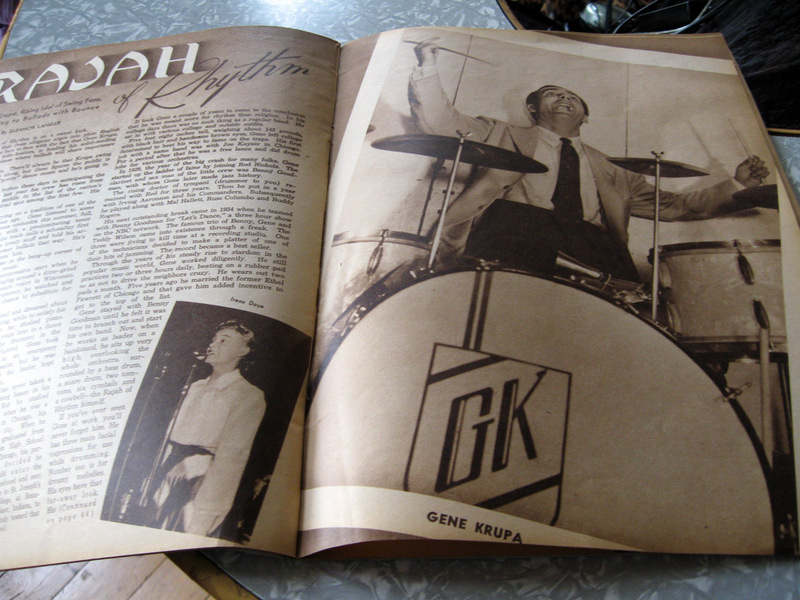 Gene Krupa jotted down his startling “Bolero” there one night. 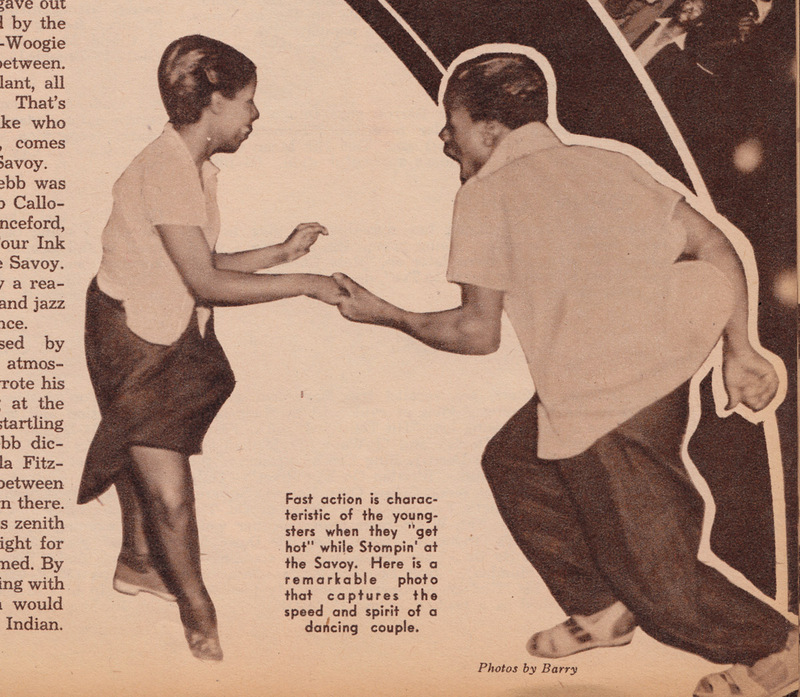 Chick Webb dictated “Stompin´at the Savoy” to Ella Fitzgerald in a moment of inspiration between dance sets. “Tuxedo Junction” was born there. The Stompin´at the Savoy reaches its zenith on Thursday nights. This is a free night for ladies. By eleven, the dance floor is jammed. By midnight the building seems to be rocking with rhythm and the dancing that goes on would bring joy to the heart of a wooden Indian. 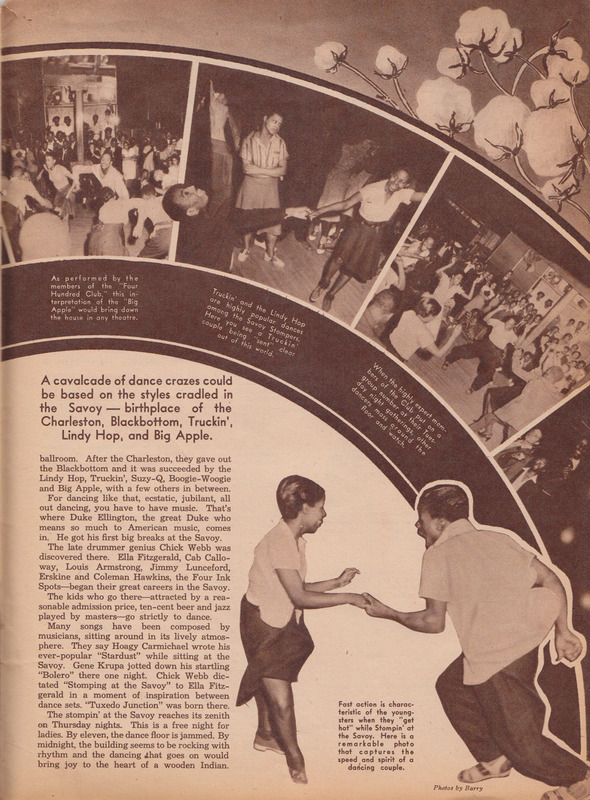 A cavalcade of dances could be based on the styles cradled in the Savoy – birthplace of the Charleston, Blackbottom, Truckin´, Lindy Hop, and Big Apple. 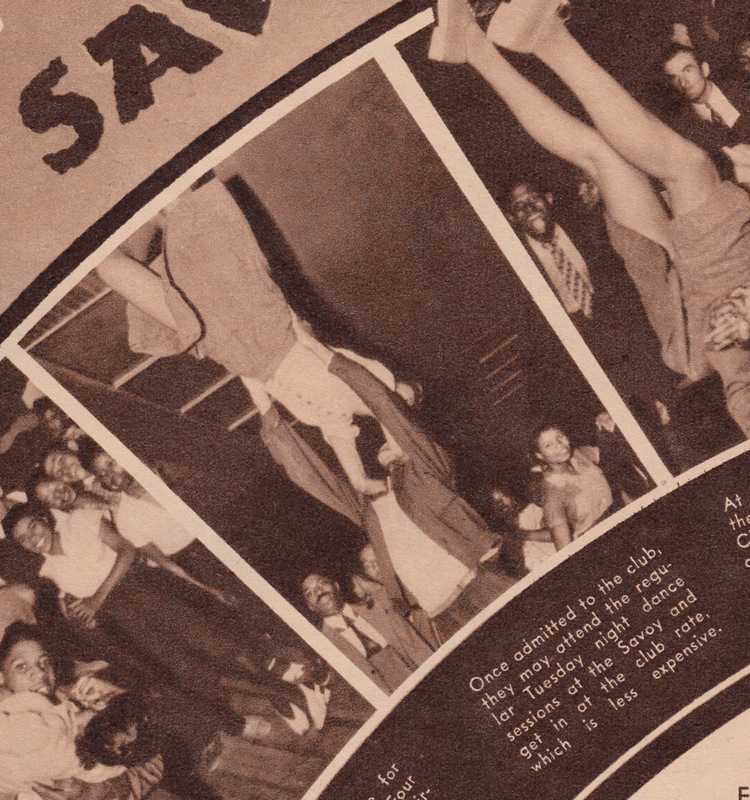 This series of action pictures shows members of the Savoy´s “Four Hundred Club” in action on the dance floor. The club is composed of the best dancers in Harlem. While the band on the platform provides torrid rhythms, they skillfully toss their partners toward the ceiling, or around their shoulders. There is no charge for membership in the “Four Hundred Club”, but aspirants must demonstrate to members that they are good enough dancers. Once admitted to the club, they may attend the regular Tuesday night dance sessions at the Savoy and get in at the club rate, which is less expensive. At these sessions of the “Four Hundred Club” you see some of the smartest amateur dancing on view anywhere. As performed by the members of the “Four Hundred Club”, this interpretation of the “Big Apple” would bring down the house in any theatre. 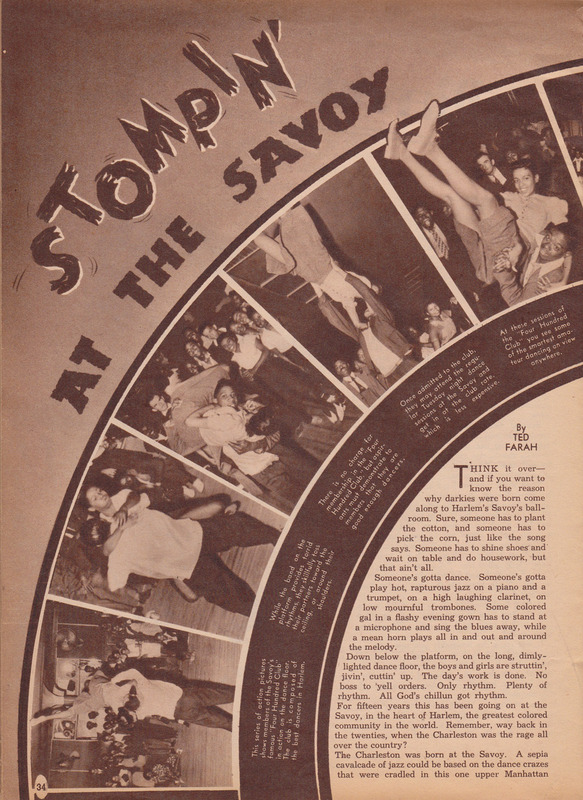 Truckin´and the Lindy Hop are highly popular dances among the Savoy Stompers. Here you see a Truckin´couple being “sent” clear out of this world. When the highly expert members of the Club put on a group number at their Tuesday night gatherings, other dancers mass around the floor and watch. Fast action is characteristic of the youngsters when they “get hot” while Stompin´at the Savoy. Here is a remarkable photo that captures the speed and spirit of a dancing couple. About me: My name is Andreas Michalke. I´m a cartoonist from Berlin, Germany and I like collecting records. Most of the records I find in thrift stores or at flea markets here in Berlin. I like a lot of music but I thought I`d focus on odd German records. Preferably with cartoon covers. All my scans are high-resolution. If you double-click on them they will get much bigger. 1. I will not use material, that is already available in digital format elsewhere. 2.The artists I present are either anonymous or pseudonymous or dead or no longer active. 3. I feel that if nobody has cared to reissue a record in 50 years, it is fair to present it. Note: Please don´t ask for re-ups. I don´t have time for that. What´s gone is gone.